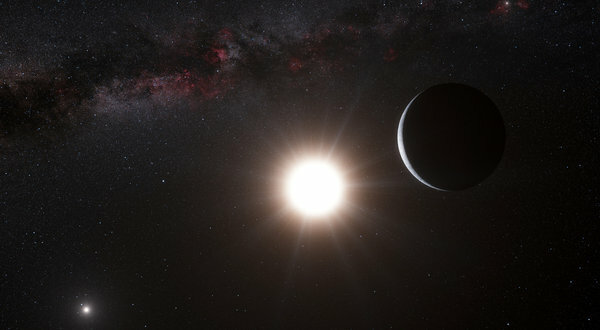 Bringing the search for another Earth about as close as it will ever get, a team of European astronomers was scheduled to announce on Wednesday that it had found a planet the same mass as Earth’s in Alpha Centauri, a triple star system that is the Sun’s closest neighbor, only 4.4 light-years away. It is presumably a rocky ball like our own, but it is not habitable. It circles Alpha Centauri B, a reddish orb about half as luminous as the Sun, every three days at a distance of only about four million miles, resulting in hellish surface temperatures of 1,200 degrees. So this is not “Earth 2.0.” Yet. Astronomers said the discovery raised the possibility that there were habitable Earthlike planets right next door and that methods and instruments were now precise enough to detect them. “Very small planets are not rare,” said Mr. Dumusque, who is the lead author of a paper being published on Wednesday in Nature. “When you find one small planet, you find others.” He and his colleagues discussed the results on Tuesday in a news conference hosted by the European Southern Observatory in Garching, Germany. Astronomers were electrified by the news of the planet, but also cautioned that it needed confirmation by other astronomers, not an easy task. The discovery also underscored the allure of Alpha Centauri as a target of space and scientific exploration. “This is close enough you can almost spit there,” said Geoffrey Marcy, an exoplanet astronomer at the University of California, Berkeley. There are three stars in that system. Alpha Centauri A, which is slightly larger and brighter than the Sun, and Alpha Centauri B, slightly smaller, are close companions, circling each other and passing as close as 900 million miles every 80 years. They in turn are being circled at a much greater distance, some one trillion miles, by a dwarf star that is known as Proxima Centauri because it is slightly closer to the Earth, due to that trillion miles, than the other two. The so-called habitable zone of Alpha Centauri B, where temperatures would be moderate enough for water and creatures like us, is about 65 million miles from the star, where a year would take 200 days or so, about the same as the orbit of Venus in our own system. Mr. Dumusque and his colleagues found the planet by the so-called wobble method, using a specially built spectrograph called HARPS on a 140-inch diameter telescope at the European Southern Observatory in La Silla, Chile, to track the host star as it is tugged to and fro by the planet’s gravity. After four years and 450 observations, they found that in the case of Alpha Centauri B, that tug imparts a velocity of about 20 inches a second, a leisurely walking speed. That is the smallest wobble the Swiss team has ever observed. Dr. Marcy said this was the kind of discovery that could reignite interest in other experiments like the Terrestrial Planet Finder, a space observatory for studying exoplanets that was once at the top of NASA’s wish list but is now languishing. Two years ago, Dr. Marcy startled his colleagues at an M.I.T. symposium with a bitter criticism of NASA, the National Academy of Sciences and the planetary community itself for failing to define and sell advanced exoplanet missions. He went on to call for an international project to launch a scientific probe to Alpha Centauri. It could take hundreds of years, but such a mission, Dr. Marcy said, could jolt NASA out of its doldrums.